Today the Trustees of the Germanna Foundation announced the appointment of Eric Larsen, Ph.D., as Archaeologist of the Foundation. 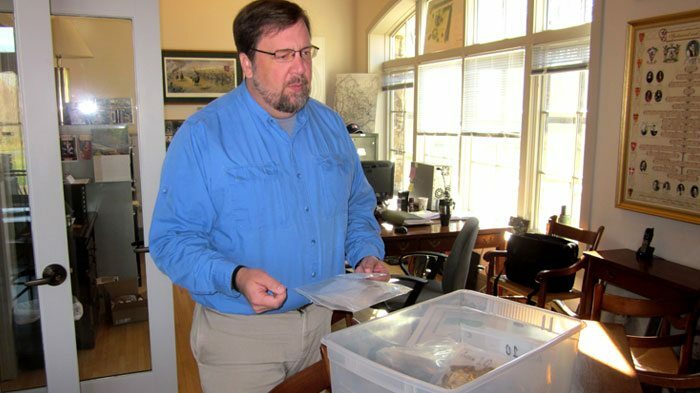 Dr. Larsen brings more than 25 years of archaeological experience to his new position, having worked with the National Park Service at Harpers Ferry National Historical Park, and for the University of Maryland on sites in Annapolis, Maryland. He directed fieldwork at the Freedmen’s and Contraband Cemetery for the City of Alexandria, Virginia, and most recently assisted with excavations at George Washington’s Boyhood Home at Ferry Farm (near Fredericksburg, Virginia) for the George Washington Foundation. He has taught introductory Archaeology classes and trained numerous students through a variety of Field Schools primarily in the Mid-Atlantic States. Dr. Larsen’s immediate tasks will include leading site stabilization efforts at the Fort Germanna site late this fall, along with developing the Foundation’s long-term archaeological research plan, and collecting data and research from previous efforts over the years, before continuing with the site’s excavation and interpretation.